Sungkai basically still one genus with teak, but the prices are a bit cheaper. Compared to teak, sungkai has lighter color, and is often also more lenient. Though slightly below the teak wood, but it also includes a good wood to use in furniture industry. This wood comes from the region of Riau. The hallmark of this wood is a brownish color with strokes or a very typical motif. Nyatoh wood is also known termite resistant and quite resistant to weather changes so often utilized for the manufacture of frame houses and furnitures. This is the result obtained from wood processing and the processing of sawdust. Kitchen set from this material is quite affordable, however, does not have good endurance against weather despite relatively anti termites. This is the result of mixing pulp with certain chemicals. 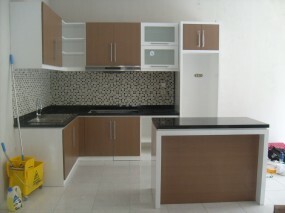 This wood is not waterproof and moisture so that it is not advisable to buy kitchen set made from this material.